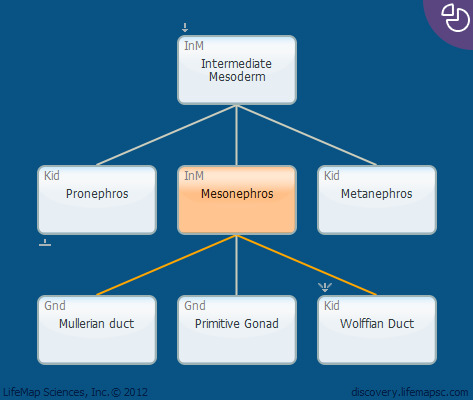 Mesonephros is the principal excretory organ during early human embryonic life (4—8 weeks). The mesonephric tubules develop from the intermediate mesoderm caudal to the pronephros, shortly before pronephric degeneration. The mesonephros gradually degenerates, and parts of its duct system become associated with the male repro­ductive organs. The gonad develops on the medial surface of the mesonephros, which also houses the primordia for the male (mesonephric) and female (Müllerian) ducts.